This week our Etsy shop went live! 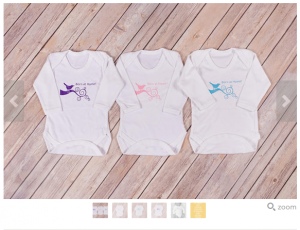 We are selling ‘born at home’ baby vests, the perfect gift for a home birthed baby! When I had my baby back in August 2015 my sister wanted to buy me a home birth baby vest, she told me she had really struggled to find a design she liked and in the end ordered one from a printers where you could choose your own text! This gave us the idea of creating our own, with all funds raised going straight back into supporting local home birthing families..
Did you know that Hull & East Yorkshire Home Birth Group is solely run by volunteers? We give all our time for free and do not receive any financial support from NCT or the NHS like other home birth groups across the U.K do. In order for us to cover costs for our website and printing, we need to continue to raise funds. We would also like to buy a pull up banner for use at events and workshops too! So please consider buying our vest and raising money for a worthwhile cause! You can buy the ‘born at home’ baby vest for £9.00 from our etsy shop! If you are local to Hull please contact us first to receive a local discount! Thank you to The Rose Quartz Photography for supplying our lovely photos!